Recently, my two-year-old nephew came to my house for a visit. I was in my home office working and wrapping up a client project when I realized how not kid-friendly a place I’d just turned him loose in. Not having kids of my own, I became quickly aware of the safety issues that little tikes face in a home office environment – and through the rest of the home, as the kitchen and bathroom areas are simply an extension of the office. Upon further research, I found that a child is far more likely to experience an accident or a fatality inside his or her own home than anywhere else. Fortunately, these injuries are easily avoided with some thoughtful education and prevention measures. First, let’s start with the general low hanging fruit: household poisons. When you have a home office, all of these hazardous elements suddenly become a consideration. A huge percentage of household products, from cleansers and kitchen knives to medicines, are potentially deadly to children and should be kept either well out of reach or behind locked cabinets. 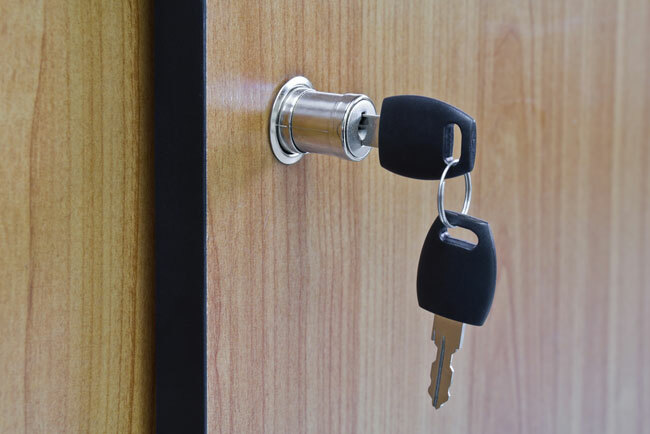 As a designer, we have installed cabinet locks time and time again as a child safety essential and they are worth every penny. Even with that handled, keep the national poison control hotline on speed dial at (800) 222-1222. Another major safety issue is electrical outlets. From printers to chargers to telephones and computers, they all require an electrical outlet. Often at that alluring eye level for crawling babies and toddlers, outlets can be dangerous for little fingers. Avoid the old-style plug-in safety caps, as they can present a choking hazard. Resourceful little kiddos have no trouble disengaging them from the outlet. 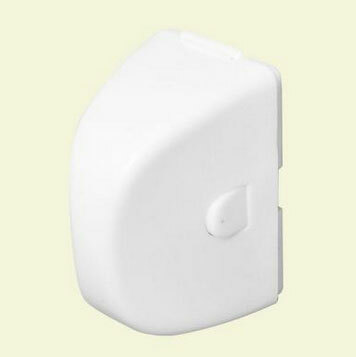 Instead, use sliding safety latches or a safety cover (like the one pictured) that completely encloses outlets, plugs in, and stores up to four feet of cord. It’s perfect for permanently plugged-in devices and features a child-resistant dual-press release. It is appropriate for use on all standard single-screw outlets. As an added measure, don’t forget to cover the exposed outlets in any extension cords with electrical tape. 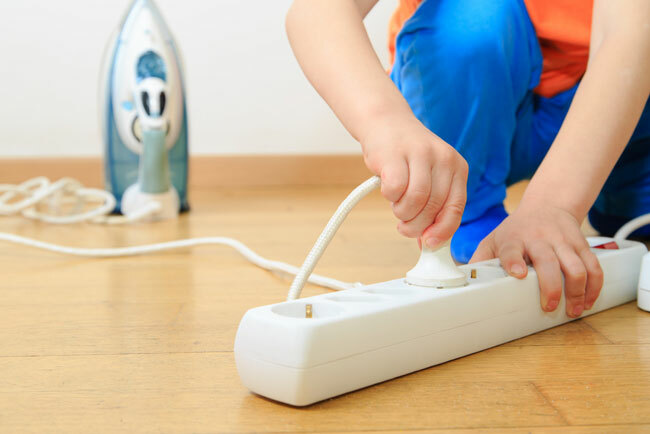 Another easy, effective way to keep little hands out of electrical areas is to simply stow electronics. If you have a busy office gadget outlet area, it could be easy for your child to start grabbing wires. Consider creating a drawer for your electronics where items charge while tucked away. This set-up will organize your electronics too – it is always helpful when everything has its own place. The beauty of working from home is that you can easily grab a cup of coffee or lunch from the kitchen. But what is it about those stove knobs that are so appealing to kids? They are a magnet for child-sized hands. A knob-locking mechanism is one way to deal with this challenge. Additionally, installing a stove guard is another excellent safety measure. Often, you can purchase kits that have all of these essentials in one kit. Cook as much as possible on the back burners of your stove and always turn your pot handles away from the edge so children can’t pull pots over and burn themselves. 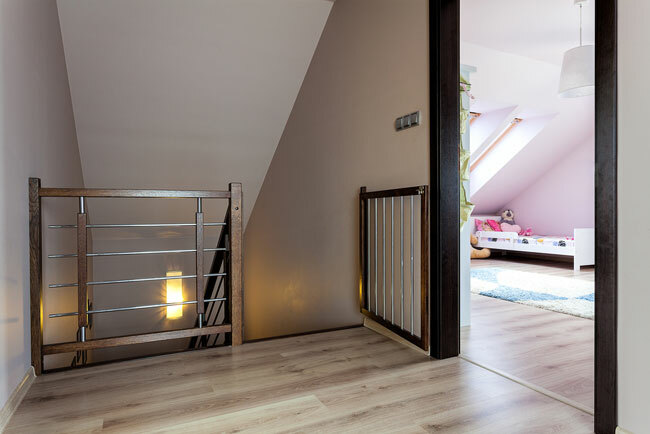 Baby gates have come a long way and can easily fit into an interior scheme. Our design team recently installed a handsome gate in a mid-century modern home to block access to a busy home office. It has a straight-slat design and, unlike with older accordion gates, little heads can’t get stuck in it. Be sure your stairs are gated top and bottom, and don’t use a pressure-style gate at the top if you can avoid it; a screw-into-the-wall version is much more secure. In an effort to ensure safety for all members of the family and visitors too, test your smoke detectors and carbon monoxide detectors and change batteries as needed. 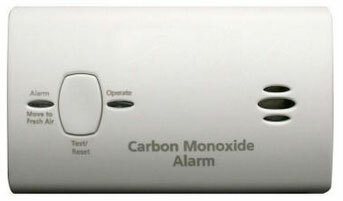 Make sure you have both a smoke detector and a carbon monoxide detector on each floor of your home and near each bedroom and home office area. Also check the expiration date on fire extinguishers and replace if needed. 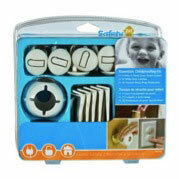 Bottom line, childproofing is an ongoing process for the home office and beyond. What you do today may need to be modified next year – not only due to your child’s growth but the ever-evolving safety technology. If you have kids at home (or kids who visit your home), you need to be aware of the safety issues that little tikes face in a home office environment - and through the rest of the home, as the kitchen and bathroom areas are simply an extension of the office.